Following up on his Ultimate Guide to Starwood Preferred Guest Airline Transfer Options, TPG contributor Jason Steele takes a look at the airline partners of American Express Membership Rewards – including their alliances and non-alliance partners you can use their miles on, as well as one-way and roundtrip routing rules – as a comprehensive web resource on the Membership Rewards program and how to maximize its 16 airline partners. In my last post, I looked at all of the Starwood Preferred Guest’s program’s airline mileage transfer partners, and all of those airlines’ partners. That list included 118 individual airlines that your Starpoints could be used to redeem flights on by transferring them to one of the program’s airline partners and then in turn booking awards on their partners – the old “partners of partners” strategy that maximizes your points by taking advantage of the myriad airline partnerships out there. Today, I am looking at the next largest airline point transfer program, American Express Membership Rewards, which you accrue with cards like the Premier Rewards Gold card and Business Gold Rewards card as well as the business, personal and Mercedes-Benz versions of the Platinum Card. 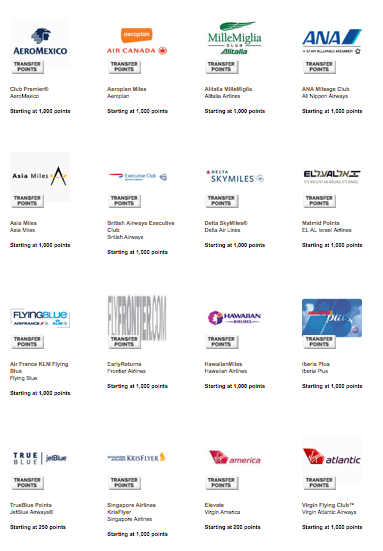 Although Membership Rewards only has 16 transfer partners (compared to SPG’s 31) at this point, there are 94 individual airlines that you can use your points to fly by leveraging those 16 direct airlines transfer partners’ partners. Unique to Membership Rewards is JetBlue, Iberia, Frontier, El Al, and Virgin America. Nine of these direct transfer partners allow one-way awards for half the price of roundtrips, five don’t, and Hawaiian only does with its own flights and JetBlue’s. Also remember that when transferring to US-based airlines including Delta and Frontier, that you will be charged a fee of $0.0006 (6/100th’s of a cent) per point up to a maximum of $99. As with the other list, I am sure that there are some smaller codeshare partners that are not included which are often wholly owned subsidiaries of the listed carriers. The second one is a list of every partner of the American Express Membership Rewards airline transfer partners including which alliance they are in and which non-alliance partners’ miles you can use to book awards on them. I did not include lists of alliance partners since that information is readily available, so if it says Star Alliance, you can assume you can use ANA, United, US Airways, etc. to book an award on that airline, plus whatever non-alliance partners I list. As before, if you find any errors, please let us know in the comments so that we can update it.